Herds of red and fallow deer. In winter, nature lies dormant and animals and plants save energy for the coming spring. So too does the average ecologist’s work schedule change from the long surveying hours of summer to a more sedate weekday 9-to-5 winter routine. At Phlorum though, our ecologists take their passion for nature conservation out of the office all year round by spending some of their spare time volunteering with different organisations, even in the dead of winter. For example, Andrea from the Manchester office is an active member of the South Lancashire Bat Group (SLBG), a charity dedicated to protecting bats across Greater Manchester, and parts of Lancashire and Cheshire. For the past three years, Andrea has been participating in countless bat surveys and she has rehabilitated dozens of injured bats found by members of the public. 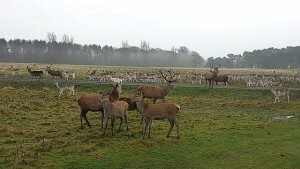 Possibly the best-known site for SLBG members is Tatton Park in Cheshire. With over 1,000 acres of parkland, numerous patches of mature natural and semi-natural woodland and a network of water bodies including the mile-long Tatton Mere, Tatton Park is a hotspot for bats, located only a 20-minute drive from the urban sprawl of Manchester. SLBG’s team of dedicated volunteers spend many hours at this stunning estate, studying the different species of bats that have made it their home. Perhaps most importantly, they are trying to locate the whereabouts of the Nathusius pipistrelle (Pipistrellus nathusii), a rare migratory species, and their efforts are proving successful. In an attempt to further improve the site, SLBG is installing bat boxes at locations where they know bats are active. For hours, intrepid volunteers team up in search of suitable trees, some daring to climb a ladder to nail the boxes down (one highlight was when one of the boxes suddenly fell off the tree after having been secured; unsurprisingly it was box number 13!). To thank everybody for their hard work, Tatton’s park rangers indulged the volunteers with a ride on the deer feeding trailer and let them have a close look at the impressive red and fallow deer herds that roam the park. 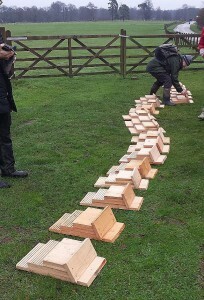 Developers are often required to provide mitigation for bats in the form of bat boxes. Sometimes, biodiversity enhancements are sought in order to earn BREEAM credits or to comply with the National Planning Policy Framework. At Phlorum, we help our clients find the right mitigation scheme for their particular needs. If you would like to have an informal chat with one of our ecologists on any aspect of ecological surveys, assessments or mitigation, please call or contact us online.